Web application firewalls (WAF) help secure your web applications by inspecting inbound web traffic to block SQL injections, Cross-Site Scripting, malware uploads & application DDoS and other attacks. They also inspect the responses from the back-end web servers for Data Loss Prevention (DLP). Combined with the isolation and additional scaling provided by App Service Environments, this provides an ideal environment to host business critical web applications that need to withstand malicious requests and high volume traffic. 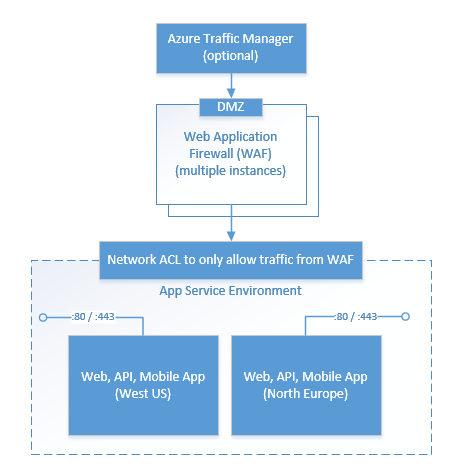 Azure provides a WAF capability with the Application Gateway. To see how to integrate your App Service Environment with an Application Gateway read the Integrate your ILB ASE with an Application Gateway document. In addition to the Azure Application Gateway, there are multiple marketplace options like the Barracuda WAF for Azure that are available on the Azure Marketplace. The rest of this document focuses on how to integrate your App Service Environment with a Barracuda WAF device. With the introduction of ILB support for App Service Environment, you can configure the ASE to be inaccessible from the DMZ and only be available to the private network. To configure an App Service Environment, refer to our documentation on the subject. Once you have an App Service Environment created, you can create Web Apps, API Apps, and Mobile Apps in this environment that will all be protected behind the WAF we configure in the next section. 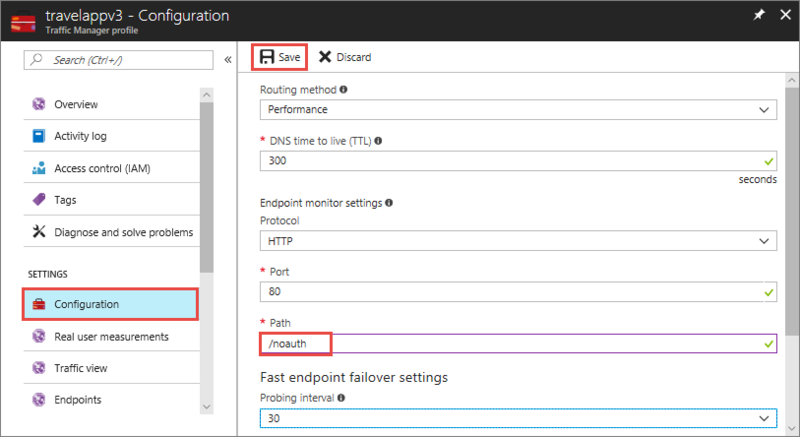 Barracuda has a detailed article on deploying its WAF on a virtual machine in Azure. But because we want redundancy and not introduce a single point of failure, you want to deploy at least two WAF instance VMs into the same Cloud Service when following these instructions. If your applications use other endpoints, make sure to add them to this list as well. Barracuda WAF uses TCP Port 8000 for configuration through its management portal. If you have multiple instances of the WAF VMs, you need to repeat the steps here for each VM instance. Once you are done with WAF configuration, remove the TCP/8000 endpoint from all your WAF VMs to keep your WAF secure. Add the management endpoint as shown in the following image to configure your Barracuda WAF. 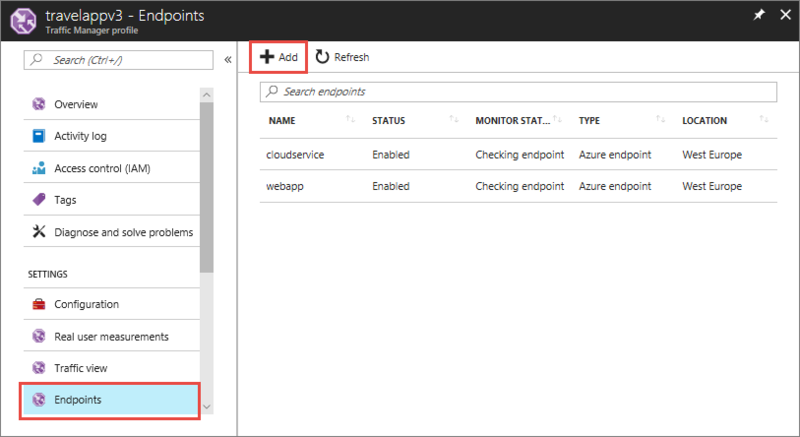 Use a browser to browse to the management endpoint on your Cloud Service. If your Cloud Service is called test.cloudapp.net, you would access this endpoint by browsing to http://test.cloudapp.net:8000. You should see a login page like the following image that you can log in using credentials you specified in the WAF VM setup phase. 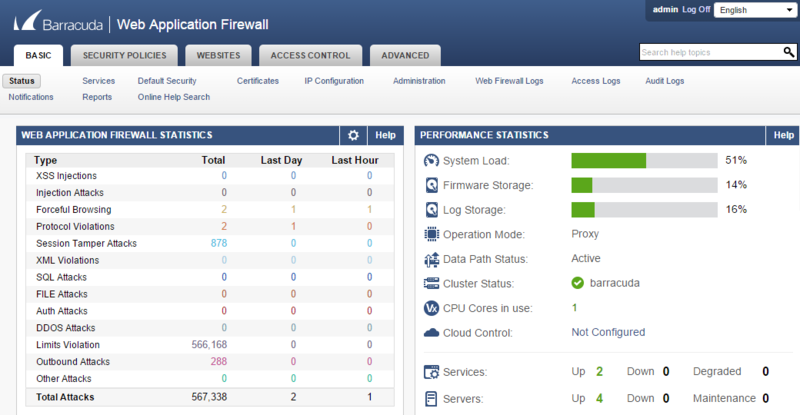 Once you log in, you should see a dashboard like the one in the following image that presents basic statistics about the WAF protection. Clicking on the Services tab lets you configure your WAF for services it is protecting. 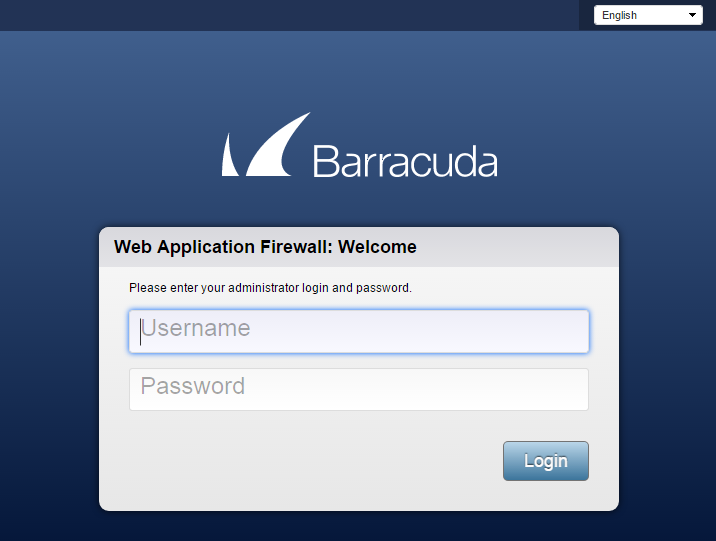 For more details on configuring your Barracuda WAF, see their documentation. 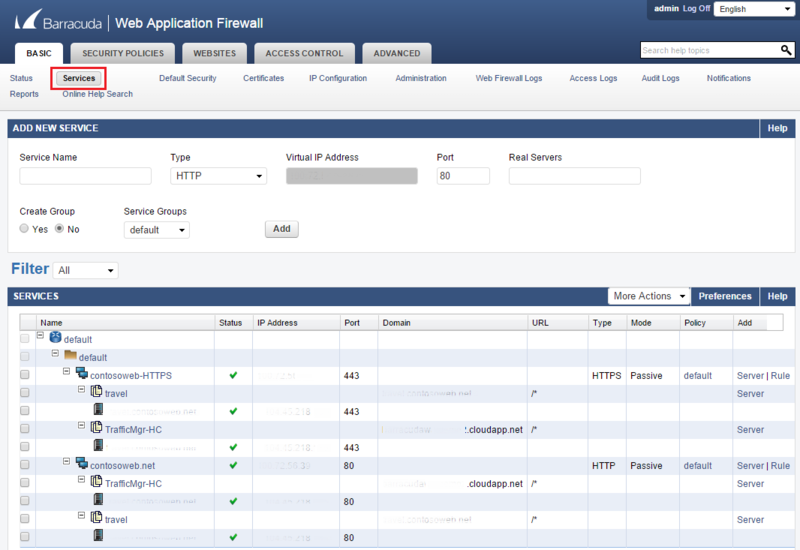 In the following example, an App Service app serving traffic on HTTP and HTTPS has been configured. Depending on how your applications are configured and what features are being used in your App Service Environment, you need to forward traffic for TCP ports other than 80 and 443, for example, if you have IP SSL setup for an App Service app. For a list of network ports used in App Service Environments, see Control Inbound Traffic documentation's Network Ports section. If your application is available in multiple regions, then you would want to load balance them behind Azure Traffic Manager. 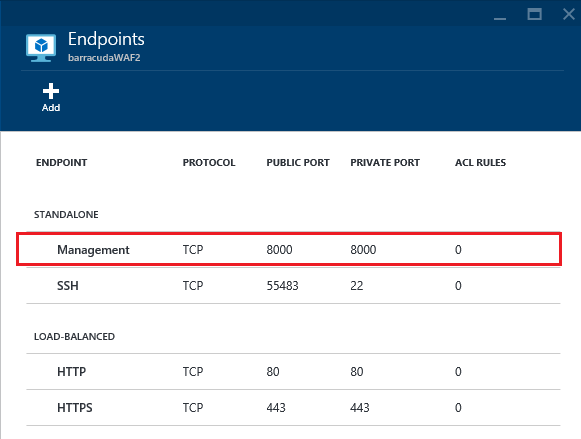 To do so, you can add an endpoint in the Azure portal using the Cloud Service name for your WAF in the Traffic Manager profile as shown in the following image. Follow the Control Inbound Traffic documentation for details on restricting traffic to your App Service Environment from the WAF only by using the VIP address of your Cloud Service. Here's a sample Powershell command for performing this task for TCP port 80. Replace the SourceAddressPrefix with the Virtual IP Address (VIP) of your WAF's Cloud Service. The VIP of your Cloud Service changes when you delete and re-create the Cloud Service. Make sure to update the IP address in the Network Resource group once you do so.